Students may enjoy the process of challenging the statements and judgments they encounter when studying history. A teacher can show them a particularly dubious bit of writing and ask them to gather evidence that might debunk the statements. "Many believe that Captain James Cook was the greatest ocean explorer ever to have lived, and that he mapped more of the world than any other man. It cannot be denied that he combined great qualities of seamanship, leadership and navigational skill. He mapped many parts of the Pacific, including New Zealand, Hawaii and the west coast of North America. " "He also set an example of how to treat a ship, its crew, and the people he met on his explorations." Quoted from Passageways: True Tales of Adventure for Young Explorers. Students could use the primary source materials in Project Gutenberg to assess some of the statements above, or they could also do a Google search to get some ideas from commentators and historians  ideas they should then test for evidence. Debunking works well with articles from Wikipedia, as students can look at the article describing their home town and check the article for accuracy, correcting mistakes of fact they may discover. 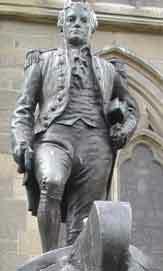 Today let's look at the article on Matthew Flinders. Do you notice any errors, any missing stories or any distortions?